Winsor McCay’s last animated film, the 1921 classic “The Flying House – Dream of the Rarebit Fiend” follows a woman’s dream about escaping foreclosure, taking to the skies with her husband – using their own house as a vehicle! In 2011, Bill Plympton’s studio remastered the neglected film, digitally cleaning each frame of damaged footage. By adding color, voices, and a new score, Bill hopes that a fresh take on the classic will bring the genius of Winsor McCay to the attention of a new generation of animation fans. This DVD includes both versions of the film and is loaded with special features, including interviews with industry historians such as Leonard Maltin, Michael Sporn, and Howard Beckerman. We’ve also included a 25 minute documentary about the making of the film produced by ShortsHD, as well as footage of Bill visiting Winsor McCay’s house in Brooklyn and photographs from the film’s premiere at the Society of Illustrators in NYC. 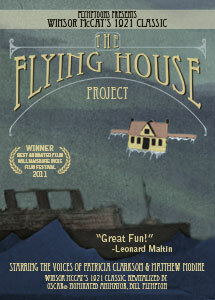 Winsor McCay's Flying House Remastered by Bill Plympton.